- Based on post-show reaction, this was considered among the best shows in company history. It was among the best shows of the year, and who knows how good it would have been had the ring not broken a few minutes into the main event. The finals are today, which will be a long 11 match show with a three-way finale, plus the usual ten-man tag team pure comedy match. This was one of the hardest tickets to get in wrestling. It would have sold out instantly, but when it was announced that Kenny Omega was on the show, the demand was ridiculous. One fairly major celebrity friend that I know couldn't get tickets (although they would have let him in) and I know Ronda Rousey was scrambling for tickets, and she was there on the stage and Matt Riddle and Michael Elgin played to her during their match. - Donovan Dijak defeated Trevor Lee with Feast Your Eyes. I'd consider this an upset since Dijak is WWE bound and Lee is a regular here and one of the company's best wrestlers. - Sammy Guevara defeated Joey Janela with a 630. This match was insane. The consensus was it was the best match so far this weekend, although there are four or five bouts you could argue for that spot. It was two guys trying to make a mark who decided they were going to do a match that reminded me of the Kevin Steen vs. El Generico Final Battle match. Guevara after the match said he was the best ever. The finish was messed up which hurt what was otherwise a great match, and they were handicapped having to follow Guevara and Janela. There was a spot that looked to be a normal near fall, and then the ref yelled to ring the bell. Haskins may have been hurt, although he seemed okay after the show. 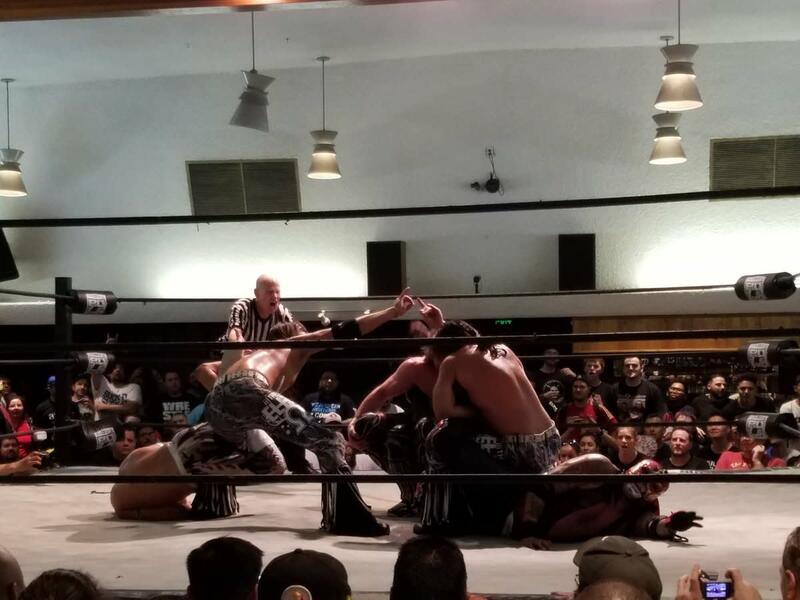 - Zack Sabre Jr. & Marty Scurll defeated Ricochet & Matt Sydal in a non-tournament match when Sydal did a top rope hurricanrana and Sabre rolled through for a cradle. Excellent match. If these two pairs teamed up regularly for the long haul they could be among the best face and heel teams in decades. The match was old school psychology mixed with new school athleticism and creativity. - Jeff Cobb defeated Sami Callihan with the Tour of the Islands. Good match. Callihan did no comedy and played to Cobb's power spots. This was a high-end G1 Climax style match: hard hitting, tremendous heat, and tons of near falls. With the exception of The Young Bucks and Omega, Riddle was the most over guy on the show. They hugged after and Elgin told him to go out and win the thing. - Keith Lee defeated WALTER with a twisting powerslam. WALTER throws some of the hardest chops around. He's about 6-foot-4 or 6-foot-5, much taller than Lee and while not a pretty body, he'd have been an absolute monster as a Bruno Sammartino contender if he came around in that era. He got over great with the crowd to the point I think a lot of people figured he'd win. Omega pinned Flamita with the One Winged Angel. They went 27:00, with some early comedy and then got into all the creative spots. The ring broke only a few minutes into the match and the ropes sagged badly. They had to improvise and change on the spot and while a great match, it probably would have been a lot better without the ring problem. One highlight was Flamita doing a top rope Asai moonsault where he got so high he kicked one of the overhead lights and actually knocked the power off. This had a lot of similarities to the Dublin Elite match except it got more serious and there was a lot more stuff. Marty Scurll did a cameo. They really tried to push Omega vs. Penta as the key face-off.